Recycle your old boxes, news print, and printouts into valuable packing material for your company. All this process requires is a cardboard shredder, which we carry. We have a variety of these available made by the trusted brands HSM and Intimus. This line is more than ideal for shipping departments, distributions centers, or large businesses; watch these pay for themselves after time. Take a look at the options we have available today and start saving time and money. 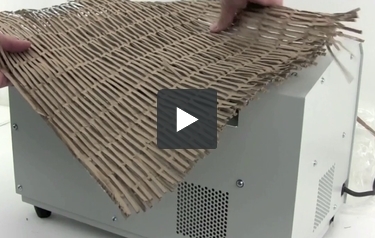 Note: Cardboard Shredders are designed for creating perforated cardboard packaging material. For a more heavy-duty shredder that is capable of shredding cardboard, check out our top of the line Industrial Shredders. Hardened cutting rollers for ripping through one layer of tough cardboard while conveniently resting on your tabletop. This is MyBinding video. If you’re looking for a solution to turning old boxes, newsprint and printouts into new packaging materials, MyBinding has your solution. We carry a variety of cardboard shredders from HSM and Intimus to make your cardboard shredding needs simple. This is a great way to both recycle and save some money. We pride ourselves in our customer service so give us a call and we can help you find exactly what you need. When image matters, MyBinding.